Last week, I looked down at my beeping phone to see a photo of my son holding a guitar. Not Keith's guitar as I had first assumed, but a different guitar, a new guitar .... his own guitar. I can't even describe the noise that escaped from my mouth at that moment; because I'd had two very painful thoughts. Firstly have you heard what a five stringed, un-tuned acoustic guitar sounds like in the hands of an untrained four year old? Secondly I suspected (correctly as it turned out) that I might end up having to throw myself between a swinging guitar and a little sister in moments of extreme tiredness and frustration. In some ways I can’t really blame him: There’s nothing more annoying when you are busy creating interpretive music than having to bat away your little sister’s persistent hands. But then as I pointed out to Alfie, using his guitar as a weapon was only going to hurt him because I don’t care how good Japanese build quality is, I’ll bet the farm that it’s no match for my daughter. 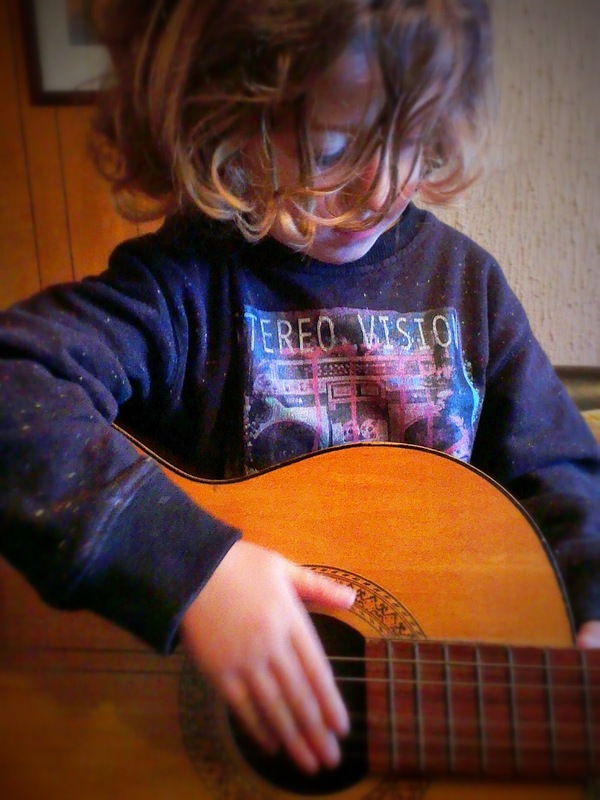 How do other parents get through that difficult musical learning curve? Is there a technique to smiling through the pain as your fillings hit resonant frequency? The Maybe Diaries was shortlisted for a Brilliance in Blogging 2014 Inspire Award.